Were one to map out the world of food, curry and BBQ would probably be located on separate continents. While various curries are popular all over the world (India and Asia), the Caribbean, in particular, has a rich history with these spice blends. That's where Pirate Jonny's comes in. Pirate Jonny's specializes in fusing Caribbean cuisine with traditional American BBQ. 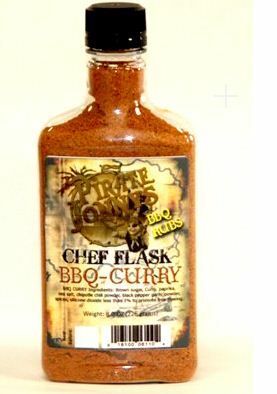 Pirate Jonny's BBQ Curry adds curry to a traditional blend of BBQ spices for a one of a kind mixture. According to Pirate Jonny's the blend can be used for a wide range of applications. Thankfully, they provided several recipes with my sample. Otherwise, I'm not sure I would have known what to do with it. Before sampling Pirate Jonny's BBQ Curry, I'd had zero experience cooking with curry. My lone experience consuming curry came at a cheap (disgusting) Indian buffet that won't soon be forgotten. BBQ Curry is available in 1.5 oz pouches and 10 oz. pirate flasks as well as large and small plastic shakers. It looks like a standard, finely ground BBQ rub. The chili powder really dominates the aroma. There is also a noticeable ethnic scent that I have to attribute to the curry. Unlike many Caribbean (and Indian) curries, Pirate Jonny's BBQ Curry is not spicy. Though there are ground chilies in the blend that are bold in flavor, they are very mild in regard to heat. I used Pirate Jonny's BBQ Curry on multiple occasions. First, using a recipe sent with my sample, I made roasted BBQ Curry shrimp. With Pirate Jonny's Caribbean influence, seafood seemed like a natural choice. The recipe was very easy. It essentially involved coating fresh shrimp in olive oil and BBQ Curry and roasting them in the oven for just a few minutes. I wish I had a picture of those beautiful prawns. The oil and rub gave them a fantastic color. The earthy spices in the chili complimented the naturally sweet shrimp. The recipe got two "thumbs up" from my wife as well. Rather than only using recipes provided by Pirate Jonny's, I decided to use a bit of the curry for tacos. I often make BBQ tacos and thought the earthy flavors of the curry may work well. I don't like to use packaged taco seasoning so I'm always looking for unique spice blends to give my taco meat (beef or chicken) some flavor. This time I used a couple teaspoons on ground beef tacos. I think the spices were bit too mild for the ground beef. However, I could see it working well with grilled chicken tacos. I'm thankful that Pirate Jonny's chose to send a sample of BBQ Curry. It's a flavor that I otherwise would have overlooked. It's broadened my horizons a bit and helped my move past my poor experience at "The restaurant of which we do not speak." After testing the product, I can safely recommend it for seafood and chicken. Stir frys would be an excellent application for this blend. I thought it was excellent change of pace from my standard shrimp recipe. To learn more about Pirate Jonny's be sure to check out their website. They've got several more Caribbean inspired spice blends to choose from. 1 Response to "Pirate Jonny's BBQ Curry"
Thanks for the good words...we use it also with Sour Cream to make a dip forf chips and for griled shrimp. We also have several vegetarian recipes on the website..and Stir-fry recipes that come out so good..and so easy to do. Thanks again.